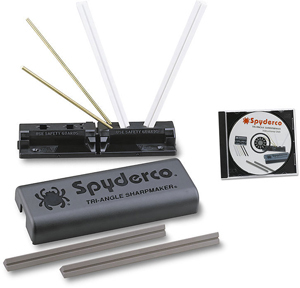 Looking at the image, you might think that the Dozier Bobcat is a fixed blade. When you’ve got it open and in your hand, you might think the same thing! Dozier’s design results in a knife that really does feel like a fixed blade. 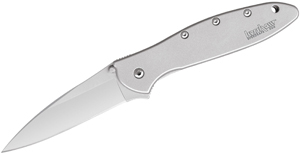 It locks open like it was never closed, and the handle design is clearly inspired by the Bull Dozier, also from Kabar. The rubber insets make the handle grippy, and also very comfortable. This knife is heavy, but it is also heavy duty. The weight helps to make every strike of the blade stick, making this a great blade for batoning wood and other camping duties. All in all, this is a great knife for less than $50. We highly recommend it. 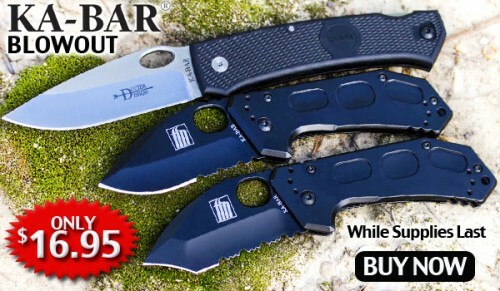 Ka-Bar has produced a number of Bob Dozier designed folding pocketknives for years now. The designs are amazing with wide, heavy blades and comfortable handles. 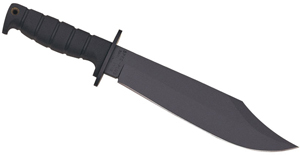 This new model has a Micarta handle and a feel that is really special. It really seems like a tool ready for work. It fits perfectly in the hand with some jimping on top of the handle for your thumb. The grip is solid and sure. The drop point blade design has great geometry for cutting, chopping or whatever.